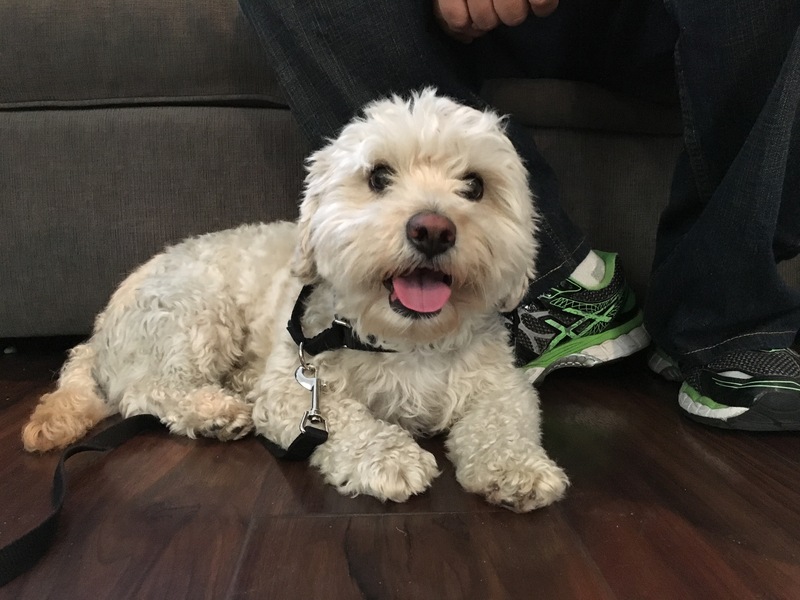 Mellow is a four-year-old Maltese / Poodle / Shih Tzu mix who lives in Los Angeles. His guardians reached out to me for help with his habit of barking at guests and charging the door to communicate he disagrees with their arrival. Mellow is also dog reactive / aggressive, doesn’t listen to his guardians and pulls on the leash. When I arrived for the session, Mellow was barking alarmingly to disagree with my arrival. This is likely due to the strategy his guardians used when dealing with this behavior. Mellow continued to bark at me while also backing up. That is usually a sign of an insecure dog. After a couple of minutes it became obvious that Mellow wasn’t going to stop barking so I placed him on the leash and stepped on it a foot away from his head. I wanted to block Mellow from engaging in his flight response and by removing the distance between us, I was able to get him to stop barking as well. You don’t want to apply this technique to a dog who is showing signs of dominant aggression, but in Mellow’s case, his barking was more of a blustering bluff. In the course of our discussion, Mellow’s guardians mentioned several things that likely impacted his insecurities; getting adopted at five-weeks-old, his guardians petting him to console or soothe him, no rules and not communicating what they expected of him in a way he understood. I addressed the lack of rules as this will have multiple benefits; helping the dog identify as a follower and helping the guardians practice being in the leadership role. Next I went over a technique that I have developed that will let the guardians use positive reinforcement to help the dog start to create some behaviors and habits that the guardians want like sitting in front of them for attention. I call this technique Petting with a Purpose. It will be a challenge for the parents to get the children to start asking the dog to sit or lay down before petting him, but it they emphasize it over the next week to ten days, most children get into a habit of asking the dog to do something to earn their praise and attention. Once everyone in the family starts Petting with a Purpose, they will basically be strengthening a healthy and respectful leader follower dynamic. Another great way for a human to practice being in the leadership role is to go for what I like to call a Structured Walk. This is a walk where the dog walks in the heel position and pays attention to their handler. I started out by going over my rules for a walk and how they can apply the twist of the leash to a Martingale collar to stop him from pulling. One of the issues Mellow’s guardians wanted to address was his dog aggression. In some cases, dogs are aggressive due to feeling as if the humans are their possessions so I took Mellow out for a short walk to see if he acted the same way without their presence. It took Mellow a few minutes to get used to the new Martingale and my rules for a Structured Walk. He tired to pull in front or mark vertical surfaces, but by correcting him right away, I was able to communicate that I disagreed with those actions. When we got to the end of the block I spotted a beautiful black lab mix puppy across the street so I asked his guardian if we could let the dog’s meet. I kept an eye on Mellow as we approached. As we crossed the street Mellow started to move a little slower so we paused for a minute once we got across the street. Taking your time and making sure both dogs are in a calm state of mind is always a good strategy when introducing dogs for the first time. The puppy turned out to be a good demo-dog. She was pulling out in front and lunging in a playful way. While play is good, some control is important, especially at first. By asking Ziggy’s guardian to keep her slightly back, he was able to get her to take it down a few notches. This even took on a physical decrease as Ziggy got down into a lay or crawl position which is more approachable for another dog. Now Mellow would have preferred to not meet this energetically playful puppy, but the experience was a good one. It told me that the issue was a lack of social skills and confidence, not actual aggression. As Mellow’s guardians start to establish rules and enforce them with good timing, he should start to relax around other dogs thinking his guardians have the situation under control rather than thinking he has to handle security himself. I went over a series of four escalating consequences I like to apply when I want to disagree or correct a dog, then enlisted the help of a neighbor to knock on the door so I could show the guardians how to use them to control the door when guests arrive. If Mellow’s guardians can call or text one another when coming home for the next week or so, they can practice this exercise without the pressure of an actual visitor waiting outside the door. Based on how quickly Mellow changed his behavior, Im guessing it shouldn’t take long to make this new behavior permanent. Because the family has many little ones over, I advised the guardian to get a kennel and train the dog to look at it as a safe place. This gives the dog the ability to move away if the kids are too much for him. It will be important that none of the kids go into his kennel so he can get away when needed. By giving him this safe place, Mellow doesn’t have to tell the kids when he has had enough, he simply goes to his room. Because of Mellow’s stunted social exposure as a young pup, the family’s lack of rules had caused him to think he needed to protect them from everything and anything. All of those factors added to his stress level which increased his anxiety. Mellow’s path to success will be his guardians taking over the leadership role in his eyes. Petting with a purpose, strict adherence to the rules and boundaries and new communication methods should help Mellow start to engage in desired actions and behaviors instead. By the end of the session Mellow was not barking at knocks at the door, was sitting faster and on the first command and was showing respect for personal space. If the family makes an effort to adopt these changes and correct or reward him consistently within 3 seconds for the next week or two, Mellow’s stress and anxiety should decrease as his confidence goes up. Eventually this will result in higher self esteem which should stop him from feeling as if heeds to lash out at dogs he doesn’t know. Once that happens, Mellow may even start to make new dog friends!